I think 360 is spending way too much time on this Penn State incident. Alot of people probbaly should have reported the incidents but didn't. What more can they say about it? The Penn State coach scandal is a big story but I was surprised 360 started the show with it. And then I was stunned they kept on if for half the show. It's an important story, it's new and flashy and scandalous but an entire half hour? Olbermann, former sports guy Olbermann, wrapped up the Penn State scandal in an excellent minute and a half ( in the Worst Persons segment). The segment on the earthquake in Turkey was the only worthwhile part of Wednesday's 360. I hated the segment with Rand Paul. Anderson gave time and exposure to a guy who hears the wall whispering and makes a big deal out of it. I changed channels and later realized I should have stayed with 360 to see if Anderson ever asked Paul for concrete sources - not wall whispering - concerning Democrats walking out and not wanting to fix the federal budget. Besides Paul's comment about whispering walls I did hear Paul was saying "I've heard people say..." Who exactly? I've read others on here complain about story selection and nominate Rand Paul's whispering walls as a prime example. Lastly, I don't watch Dancing With the Stars so I felt like I was out of the loop during the Ridiculist. Funny how there wasn't a single mention on 360 about some of the election results across the country Tuesday night that favored Democrats and turned away from the GOP/Tea Party--instead we get a pointless interview with Rand Paul spouting out nonsense about President Obama "refusing" to work or compromise with Republicans and unsubstantiated rumors about Democrats in the Super Committee--why would they give him airtime for that? He had no facts to back any of it up but it did give him a platform to bash the President. Months and months of Republican obstruction and the President attempting to compromise with them over and over but that fact somehow escapes AC360. Frankly, I'd rather watch an endless loop of AC interviewing Toddlers and Tiaras on his daytime show than to sit through lousy and unfair political reporting like this. Didn't even realize Anderson was on tonite. Saw Isha reporting on Penn State in what seemed like forever. USA Today reported that AC's day show has gone up slightly ratings wise to l.6. However, in syndication Judge Judy leads the pack with ll million viewers and in the top 25, Regis and Kelly with a 3.6, which is not bad for the morning slot. And Housewife lovers, the HWOA got a good start with a 2.9 lead, the highest since it began. Personally only NJ and Atlanta are of interest. They could easily drop the Beverly Hills wives and no one except AC would notice, or care. 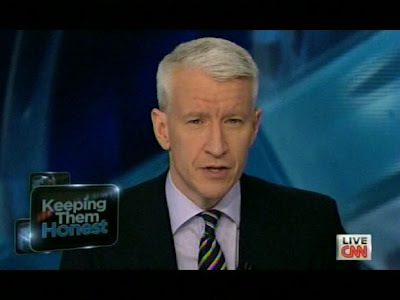 I became a viewer of AC360 because of their attempts to bring viewers both sides of the story. The smears, attacks and condemnation of Joe Paterno on last night’s program has left me wondering why they have abandoned their 360 approach. The crimes committed against children by Sandusky were unforgivable but let’s remember who is the monster here. Joe Paterino will accept more than his share of responsibility, that’s just the kind of man he is and he will work the rest of his life to make amends. He did not deserve the one sided vigilante style reporting served up by Anderson Cooper & team last night. Phebe a 360 view has gone the way of the Model T and been replaced with sensationalism and negativity. I watched ESPN last night and a reporter from ABC's GMA was at Penn State he tried to find someone to take the other side though against JOPA, but no one would come on camera for fear of reprisal. So it looks like the media yes even 360 and the MSM, when they try can't get away from sensationalism. Phebe, I agree with you 100%. Franco Harris was on Erin Burnett's show last night and he said the same thing about Joe Paterno. In a very well-spoken manner, he said he thought the media was focusing too much attention on Paterno, and not enough on the person who committed the acts. @anonymous 2:28, We don't usually watch OutFront at our house but my husband received an email yesterday afternoon from a Penn State friend saying Franco would be on, so we tuned in. I was VERY impressed with Erin's coverage of the story. She needs to give Anderson a lesson on fair and balanced reporting.